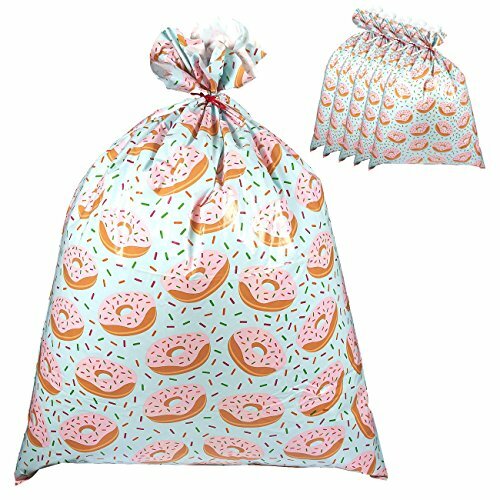 This set of 6 giant gift sacks feature donuts design. As an alternative to boring gift bags, these gift sacks are something like Santa would use! Simply place your gift or gifts in the bag and tie the top with the included (6 pieces) string. Have a large gift that doesn't fit into the standard square or rectangular box? These jumbo gift sacks are just the right solution! Store gifts to be given out to all the children inside one of these giant bags. Sit back and enjoy watching children guess what's inside the giant sack! No need to rummage around for strings because 6 pieces of braided strings are included, one for each gift sack. Each gift sack measures 36 x 48 inches. Material:Excellent linen fabric, it has a slight sheen. Neat Stitches:Well made with tight stitching and there have no loose threading, so it is strong and durable for holding the lightweight items. 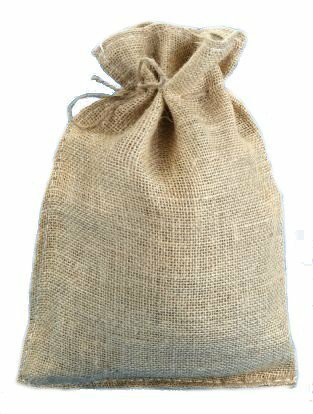 Thick Linen Fabric:The fabric was thick enough where you couldn't see the contents through the bags, so that will be good for protect the items inside. Old fashioned Looking:The design of cross stitch can be showed the style of old for the bags. 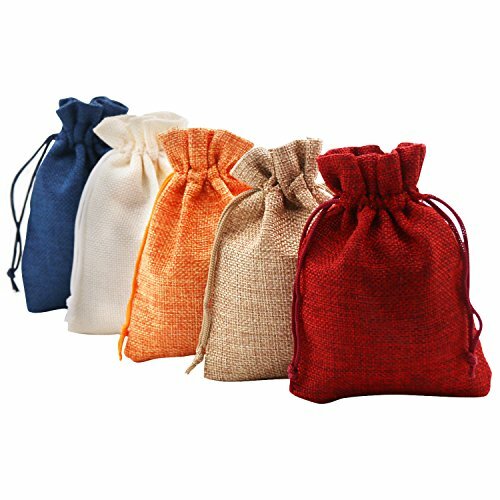 Versatile Pouches BagsSuitable for wedding favors, jewelry packaging, gifts wrapping, parties, candies, festivals, small gifts, craft project and so on. 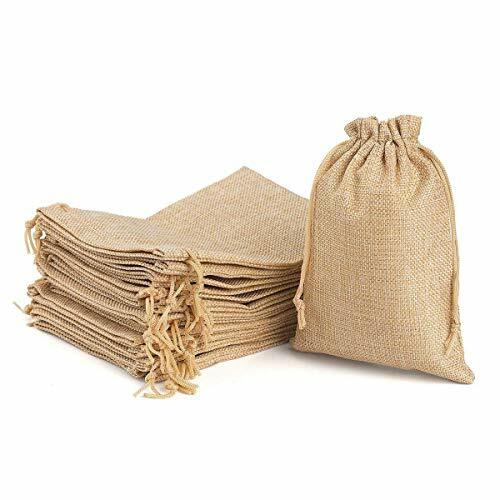 Package included:20 x linen bags Note: Since the bags are new, so they do smell a bit. Just air them out prior to filling and it should be just fine. Wrap it up, tie it up and send them on their way! Let your guests take home their bundle of goodies with this Cute as a Button Designed Giant Gift Sack. 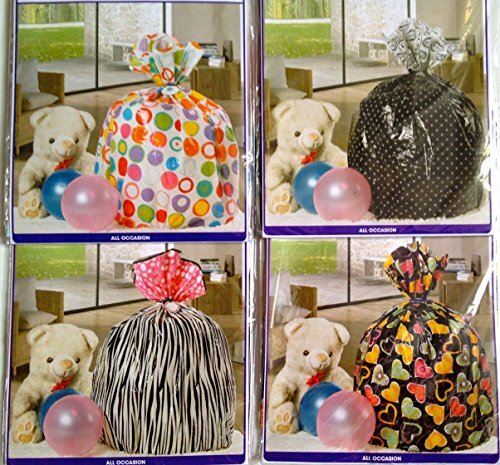 This giant Gift Bag Sack Set of 4 36" in x 44".is great fpr any child girl or boy they will love it. The fun, cheerful, bright colors and patterns that are all over the bag. You will love watching your loved ones faces as they unwrap ther giant surprise inside. Perfect for any birthday boy or girl, young or old. This gift bag set comes compleat with tag and tie string. 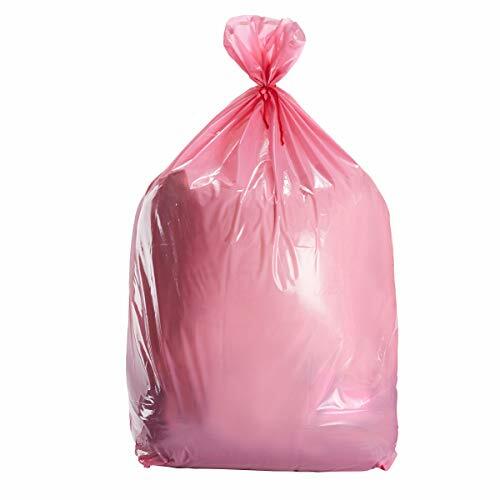 This set of 6 giant gift sacks come in plain pink color. 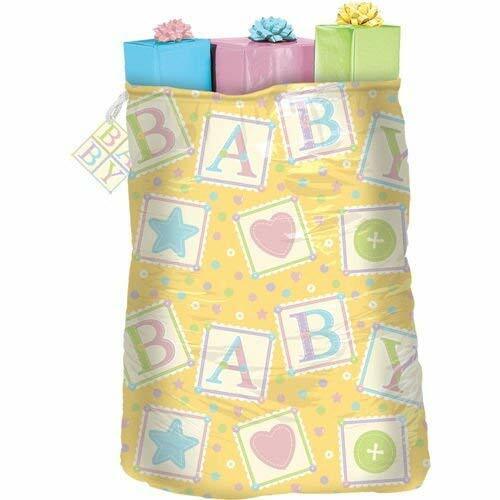 As an alternative to wrapping paper, these gift sacks are made to wrap oversized gifts or items with odd shapes. Simply place your gift or gifts in the bag and tie the top with the included (6 pieces) red string. Its plain color makes it perfect for any occasion or event so make sure to always have some of these gift sacks on hand. GIANT GIFT BAGS: Gift Boutique set of 3 Giant Christmas Gift Bags feature 3 different classic Holiday designs in red and white including A) Santa with Ho Ho Ho, B) Assorted Christmas gifts, stockings and penguins C) Assorted Christmas trees, candy cane, gingerbread etc. SUPER QUALITY: Bags are made of sturdy Fabric which makes them very durable and reusable. Hide the kid's gifts in these bags and have them guess what's inside. Cannot see through what's inside. GREAT FOR LARGE OR ODD SIZED GIFTS: Perfect for large toys and big stuffed animals, these red gift sacks feature festive Holiday prints. You can also fill these giant bags with many smaller presents for a convenient way to tote gifts to a holiday party or yuletide gathering. 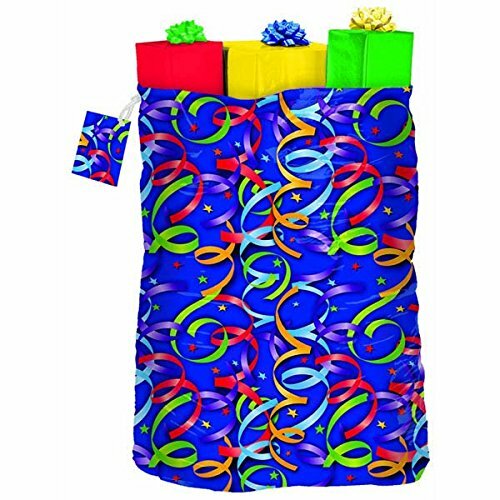 VALUE PACK: Get 3 jumbo gift sacks at a value price! Make sure to always have some on hand when the gift giving season comes around. DIMENSIONS: Each gift sack measures 36 x 44 inches. Each bag comes with a ribbon to tie the bag and a gift tag to personalize. The santa sack is perfect match for Santa Claus dress up.Nice christmas pattern designs,Lagre capacity to hold toys,food,all kinds of gifts. There also have a large space available for you to customize. 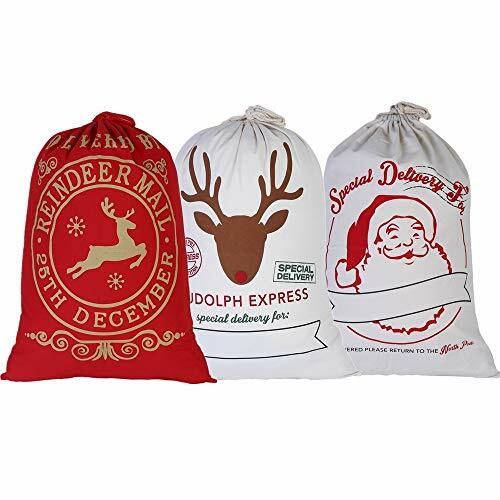 You can personalized and named the santa sacks with handwriting or embroidery and your family or friends would surprise to receive a bag full of presents with their names on it.I think they are going to go crazy when they see a bag under the tree with their names on it from Santa. 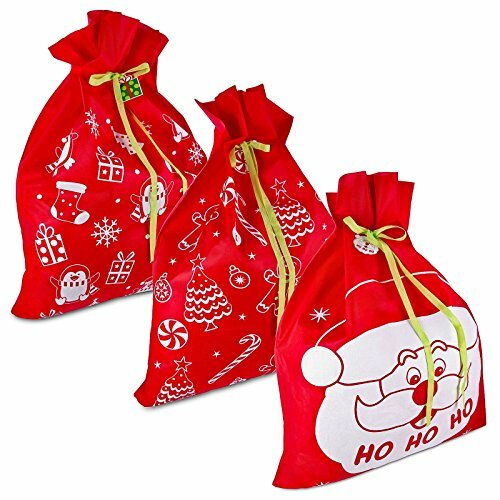 Bonison Random 2 Pack Christmas Bags Santa Sacks Canvas Bags For Gifts Santa Sack Special Delivery Extra Large Size 27.6"x19.7"